The African country of Mali is attractive in terms of investment in the VoIP termination business. With a high rate ($0.17- $0.2), Mali has the well-developed mobile sector. The quality of the Internet connection is not too good as the average speed varies from 512 Kbps to 5 Mbps. However, you can place a VoIP call termination gateway in the capital - Bamako, where the fastest Internet is available. But how big will business costs be for connecting the Internet? In Mali, there are quite a lot of Internet providers that provide broadband access services (DSL\ADSL, wireless). The most popular of them are Sotelma and Orange Mali. 6 Mbps costs $500 per month. The optimal package of the above is 1 Mbps for $36 a month. Both Internet plans provide for a $22 monthly subscription fee. They differ from each other with additional features that include a welcome package of voice minutes for mobile calls, fixed telephone services, as well as the speed of the Internet. Confort'O provides a 512 kbps download speed, while Premi'O provides up to 2 Mbps. 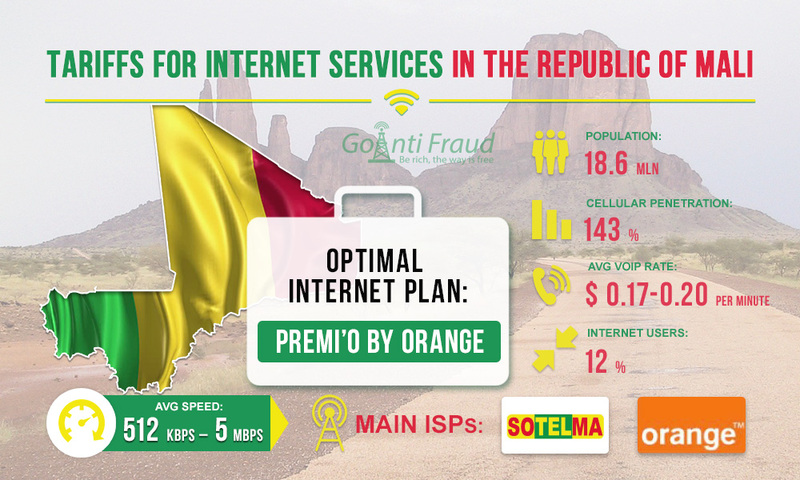 The most profitable Internet plan for terminating calls in Mali is Premi'O from Orange. The speed of 2 Mbps will be sufficient for the smooth operation gateways equipped with a few channels. The main thing is that you should make sure that the Internet provider, which is also a mobile operator, cannot see your VoIP traffic. GoAntiFraud offers its clients a traffic optimization module that masks calls from the provider.